Brands can now target audiences on YouTube based on their Google searches and the places and apps we like. This is part of a slew of updates YouTube is launching at Advertising Week today. The update was based on the insight that campaigns using intent-based audiences on mobile have 20% higher ad recall lift and 50% higher brand awareness lift, relative to campaigns that only use demographic audiences, Diya Jolly, director of product management for YouTube and Video Monetisation, wrote in a blog post. So using Custom Affinity Audiences, YouTube will now let advertisers target people based on the kind of searches they do, or the kind of places and apps they like. That means an outdoor outfitter could use Custom Affinity audiences to potentially reach people who have searched for skis, spent time at ski resorts, or have downloaded a ski resort’s trail guide app. "That means an outdoor outfitter could use Custom Affinity audiences to potentially reach people who have searched for skis, spent time at ski resorts, or have downloaded a ski resort’s trail guide app," Jolly explained. YouTube has also ramped up the platform's personalisation capabilities. It has launched a new tool, called Director Mix, that simplifies the ability to create different versions of the same creative tailored for different audiences. "You give us the building blocks of your video ad, like different voiceovers, background and copy, and our system will create thousands of versions to match your various audience segments," Jolly said. 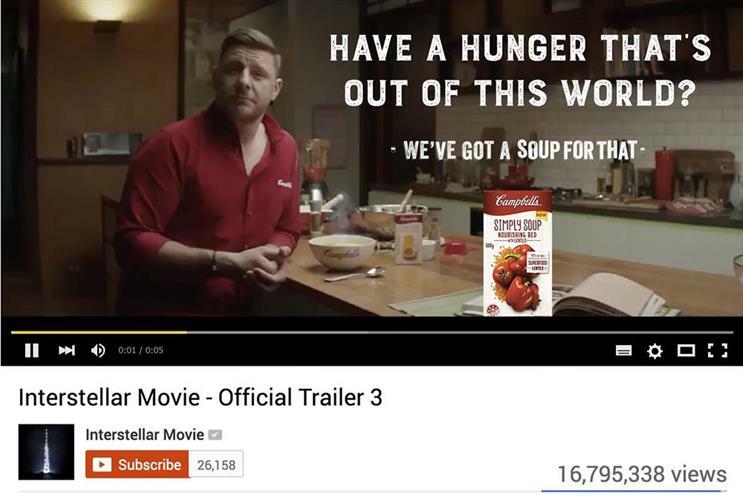 A brand that has trialled this, she mentioned, is Campbell's Soup which created videos with copy based on the content people were about to watch. "For instance if you clicked to watch clips from Orange is the New Black, you’d see a bumper asking, 'Does your cooking make prison food seem good? We've got a soup for that.' And it worked: Campbell’s earned a 55% lift in sales and a 24% lift in ad recall with this campaign," she said. In the same vein, YouTube has launched a Video Ad Sequencing tool that lets advertisers deploy ads over time. The new feature under AdWords Labs will let advertisers string together ad creative, guiding consumers down a path depending on what ads they are responding to. A brand that's used this is Ubisoft. To drum up excitement for the latest Assassin's Creed game, Ubisoft cut four sequential six-second bumper ads, each with a critical element of their longer trailer. The brand used Affinity Audiences and Video Ad Sequencing to serve the ads to core E3 audiences. The campaign reached almost 15 million unique viewers and resulted in a 25% bump in awareness and more than double the number of searches for 'Assassin's Creed'. YouTube is rolling out a global approach to measuring sales lift with Nielsen MPA (Matched Panel Analysis). The solution is geo-based and will offer a fast and media-agnostic way to determine which online ads are driving offline sales. This implementation means that clients can measure video alongside other Google media. "From looking at the Nielsen MPA studies we’ve run to-date, we found that YouTube drove sales lift for the advertised product in 14 of 19 studies globally, with lift exceeding 5% in multiple studies," Jolly said. YouTube is changing, but will it be enough to retain its online video crown?